Besides the film’s furry stars, and the message about our veterans (of all kinds), the movie doesn’t offer much in the way of entertainment or believability. Soldiers risk their lives everyday in the field, and those soldiers come in all shapes and sizes. When they return home, they can suffer varying degrees of Post Traumatic Stress Disorder and, sadly, some don't return home at all. No less is true for MWD or Military Working Dogs. 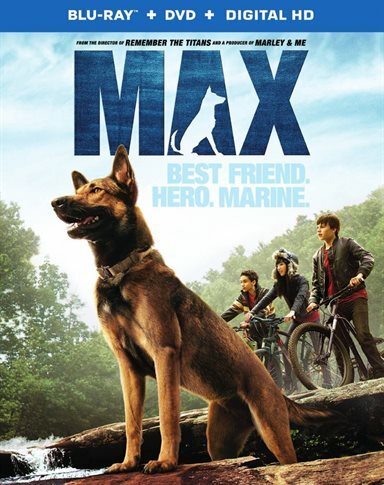 Max, a movie about one such dog, comes to home theaters on Blu-ray and DVD this Tuesday. Max worked in Afghanistan alongside his human counterpart, Kyle Wincott (Robbie Amell; The Duff). When Kyle gets killed in the field, Max can't cope with his loss and is in danger of being put down. As an alternative, Max is given to Kyle's family and his younger brother, Justin (Josh Wiggins, Hellion). It seems Justin is the only person, with help from his friend, Carmen (Mia Xitlali; Selling Rosario), who can calm Max and train him. When Tyler Harne (Luke Kleintank; Pretty Little Liars), one of Kyle's best friends and military colleague, is discharged and returns home, something isn't quite right. Given a job by Kyle's father, Ray (Thomas Hayden Church, We Bought a Zoo), at his storage facility, Tyler uses the space for some underhanded dealings, and when Ray becomes kidnapped, it is up to Justin and Max to save the day. The obvious stars of the film are the six dogs that play the role of Max. They steal every scene they are in and take the focus away from the other actors, with the possible exception of Xitlali. She has a presence that draws your attention to her and she creates nice compliment to her four-legged counterpart. The movie itself isn't great. It starts off interesting enough, but gets convoluted when Tyler comes home and becomes an arms weapon dealer. The "my dad is missing, let's go find him, Lassie (Max)" storyline is corny and cheesy and takes an otherwise interesting story about MWD and veterans and turns it into something else entirely. Presented in 1080p, the quality is excellent. The colors are crisp and the blacks during the evening scenes are full. The 2.40:1 aspect ratio is exactly what you would expect from a Blu-ray. The DTS-HD 5.1 audio is great, especially during the Afghanistan war scenes and the gun fight with the kidnappers. There are only two extras on the Blu-ray but both are meaningful and interesting. The first is a look at the 6 dogs used for the film and the admiration the actors have for their canine counterparts and the latter feature discusses WMDs and what a vital and important role the y play in the war effort. The pace of the film is slow and drags. The two storylines seem thinly sewn together to make a movie long enough to be a feature film. Besides the film's furry stars, and the message about our veterans (of all kinds), the movie doesn't offer much in the way of entertainment or believability. It's a shame that the subject is highlighted in such an uneventful way. It's a message that should be spread and I feel they missed their marked in doing so. Download Max from the iTunes Store in Digial HD. For more information about Max visit the FlickDirect Movie Database.